Self-holding Simmerring made from two functionally suitable elastomer components and an integrated steel strip. 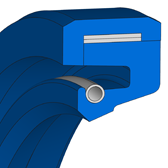 The tension springs support the radial contact pressure on the shaft. 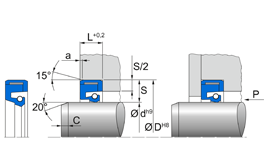 Self-holding Simmerring for shaft pass through walls in heavy machinery manufacture. An axially accessible housing is necessary for the fitting. The non-pressurised side of the sealing ring is to be reinforced for pressurisation. In the unpressurised state, an axial reinforcement on the non-pressurised side is not necessary. Only endless self-holding Simmerrings Radiamatic RS 85 are available.